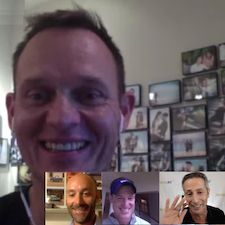 The DomainSherpa Discussion is where domain name industry news is discussed with a panel of veterans and thought leaders, including Andrew Allemann, Michael Berkens and Page Howe. Hosted by Tess Diaz. Chinese Numeric and Acronym Boom or Bubble? • Are we experiencing too much growth in too fast a time period? • Is this type of growth sustainable? • Is this a domain name bubble that’s going to pop? • Should you stay clear of this investment? We discuss these questions and more with Sherpas Andrew Rosener, Frank Schilling and Shane Cultra. • Berkens flipped a $1,111 domain for $50,000 in less than 60 days, learn how! • Are first names, like Linda.com or Frank.com, good investments? • How to stop spammers from contacting end users for domains at auction? • .XYZ numbers are starting to decrease…it is plummeting? • Which is better, Aarons.com or FurnitureRental.com? The brand vs. keyword debate. •Is ICANN in trouble and should the transition even happen? • Are .COM values increasing or decreasing as a result of the new gTLDs? • Should you be doing outbound sales calls by telephone on inbound inquiries by email?